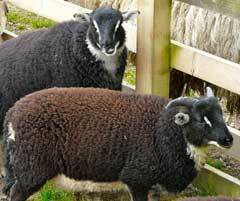 Torddu is Welsh for ‘black belly’, a characteristic of these badger-faced Welsh mountain sheep. A black stripe runs from chin, along the belly to the tail. Additionally, they have partly black legs, ears and stripes on their faces. The main fleece varies from pure white and grey to light brown. 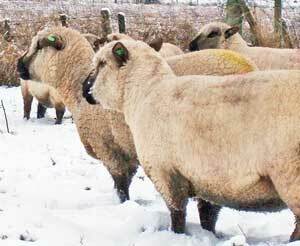 The reverse colourway is known as Torwen, which is Welsh for ‘white belly’. The rams of this medium-sized badger-faced Welsh mountain sheep have dark spiral horns. This ancient Welsh breed was once very common, but became less so during the Middle Ages when pure white wool was in high demand. Numbers are now increasing with naturally coloured wool being loved by handspinners and knitters alike. Torwen wool can be bought in 50g aran weight balls from Sheepfold’s wool shop. 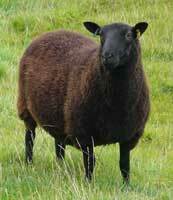 The only completely black breed found in the UK, the Black Welsh Mountain sheep produces a fine wool suitable for cloth and knitting yarn. In the summer, the wool tips bleach to a reddish brown colour. 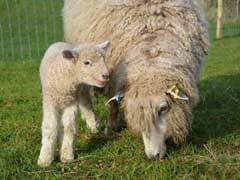 It is a small sheep with a fleece of 1-1.5 kg; staple length typically is 8 to 10 cm. Only the rams have horns. It is kept in small flocks, thriving on short upland grasses, throughout the UK. Although once on the Rare Breeds Survival Trust watchlist, numbers are now at a safe level. Black Welsh Mountain wool can be bought as scoured and carded fleece from our wool shop. Having evolved during the 19th century, these longwool sheep were bred in east Cumbria and Tyne and Wear, combining hardy hill breeds with cross-bred ewes. They have a broad muzzle and distinctive Roman nose! The name is due to the colour of the skin on the head showing through the short white hair. The lustrous fleece typically weighs 1-2 kg and all the sheep are hornless. This wool is available in our wool shop in three natural shades of aran weight yarn and also spun with Herdwick as an aran weight yarn. Blueface Leicester is used in our Sampler Bag kits, our fingerless mittens kits and our Swinside Shawlette kit. This small primitive breed originated in the 19th century and has been used by crofters on the Scottish islands. The fleece of most Boreray is cream, though some can be grey or brown. Rams often have a dark collar around their necks. The face and legs are grey or black with white patches. Typical fleece weight is 1.25 kg and this breed natural sheds its fleece – instead of shearing, fleece is collected by ‘rueing’ (plucking). Both ewes and rams have horns. The Boreray is classified as an ‘endangered’ breed by the Rare Breeds Survival Trust, making it the rarest of all native British breeds. This wool can be bought as 50g aran weight yarn from our wool shop. The Cormo Sheep was first developed during the 1960s in Tasmania by crossing Corriedale rams with carefully selected superfine Saxon Merino ewes. Cormo sheep produce a long stapled, high yielding fine-wool fleece with a very uniform fibre (90% within 2 microns of the average!). The average fleece weight is 5.5 kg. Our Cormo wool comes from the Falkland Islands in the South Atlantic, which makes it still British! The wool was then spun within the UK. Sheep farming remains the major form of land use in the Falklands, though the major income source is now the sale of fishing licences. Grey Cormo can be bought as 100g aran weight skeins from our wool shop. The Corriedale was developed in New Zealand and Australia during the late 1800s by crossing Lincoln Longwool rams with Merino females. The Corriedale sheep is large-framed and produces a fleece typically weighing 7 kg. This is often semi-lustrous and is used to produce soft yarn and felt. Colours vary from pale silver through to black including various shades of fawn or moorit. This breed is tolerant of the UK climate and was introduced into the UK in the late 20th century. Our Corriedale wool comes from the Falkland Islands in the South Atlantic. 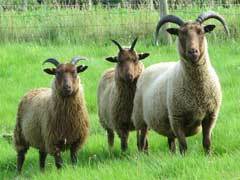 The wool was then blended with UK Manx Loaghtan fleece and spun within the UK. The resulting pale toffee/camel coloured wool can be bought as 100g DK weight skeins from our wool shop. 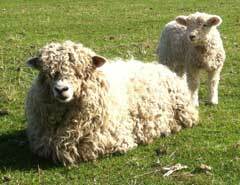 The Devon and Cornwall Longwool breed originates from an amalgamation of the old South Devon and Devon Longwool breeds. This large sturdy sheep has a white fleece though this is not as fine as other longwool breeds. However, weighing up to 10 kg, this fleece is valued, especially when lambswool. The curls are much thicker than those on Teeswater or Wensleydale sheep. This breed is classed as ‘vulnerable’ by the Rare Breeds Survival Trust. Photo with thanks to Lynn Arrowsmith. This Swedish breed was developed by the Vikings on the island of Gotland over 1000 years ago. 110 sheep were imported to the UK in 1972 and now there are around 1500 of these medium size, fun and friendly sheep in the UK. However, with the Vikings being great seafarers, ancestors of these sheep were imported many years before and developed into the related popular British breeds such as North Ronaldsay and Manx Loaghtan, so earning their place on this website! Gotland sheep have long, lustrous, curly and fine fleece in a range of shades of grey, from silver to charcoal. The wool felts very readily. Vikings brought sheep to the Western Isles of Scotland more than 1000 years ago. 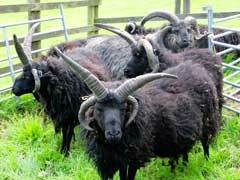 The Hebridean sheep, also known as St Kilda sheep, evolved from these. This rare breed of small primitive sheep has lustrous black wool with tips sometimes becoming sunbleached and some of the sheep going grey with age! Both ewes and rams have two or more horns. This breed forages well and can thrive on poor pasture, making it unrivalled where control of brush and weeds is needed while maintaining delicate ecosystems. Fleece is typically 1.5 kg, with a staple length of 5 to 15 cm. Following RBST action to highlight this breed in managing heathland, the numbers of sheep have increased sufficiently for this breed such that it is no longer considered to be at risk. This wool can be bought in 100g skeins and as scoured and carded fleece from our wool shop. It is also used in our Rosetta Bag kit. Herdwick sheep are native to the Lake District and are thought to be the hardiest of the British breeds. The lambs are born with black wool, but this fades to different shades of grey with age. The head and legs are pale grey and the rams have horns. The coarse fleece typically weighs 1.5 to 2 kg, with a staple length of 15 to 20 cm, and is mostly used for carpets. It is now also being used in loft insulation. This wool is used in our Whernside and Lund cushion kits. Herdwick wool can also be bought in 100g skeins either as pure Herdwick or blended with Bluefaced Leicester from Sheepfold’s wool shop. Scoured and carded batts of hogg wool (from first shearing) are also available. 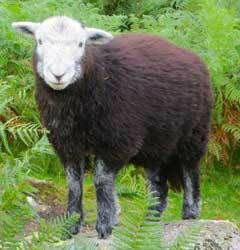 This is the sheep with a coat of many colours, namely black or brown, grey and white. Both ewes and rams have horns, usually two or four, but sometimes even six. The fleece weighs 2-2.5kg and is popular with handspinners as several colours are possible from a single fleece. The breed is thought to have originated in the Middle East which then spread throughout Europe, reaching Britain by the 18th century. Jacob fleece is very popular with hand spinners providing more than one natural colour in a single fleece. It is not uncommon to see a small flock of Jacobs alongside larger flocks of a different breed, to provide fleece for spinning! This wool is used in our Fara bag kit and pink/grey Jacob Jester bag kit. Leicester Longwool are large-framed, dual-purpose sheep which grow a heavy, lustrous and even-textured fleece, with weights up to 15 kg being recorded! More typically fleeces weigh between 5 and 7.5 kg, with a staple length of 20 to 25 cm. Practically every British longwool sheep owes some of its properties to the Leicester Longwool and it is still crossed with many of the mountain breeds. Most of the sheep have a white fleece, but one-third are 'black'. The Black Leicester Longwool sheep have silver grey sides with darker wool around the edges; these sheep, very popular with smaller breeders, were admitted to flock registration in 1986. Leicester Longwool is now classed as ‘vulnerable’ by the Rare Breeds Survival Trust. Black Leicester Longwool is available in 100g aran weight skeins in our wool shop. Photo with thanks to Michelle Storton. Llanwenog sheep result from the crossing of Shropshire Down sheep with hill breeds in west Wales, at the end of the nineteenth century. The breed became officially recognized with the formation of the Llanwenog Sheep Society in 1957, to promote and preserve what was then recognised to be a separate breed. The name Llanwenog is taken from the village of the same name, 60 miles west of Cardiff. These hornless sheep have solid black faces with a small tuft of wool on the forehead. Fleeces weigh typically 2 to 2.5 kg with a relatively short staple length (6 to 10 cm), fine texture and free from kemp. Sadly this breed has declined in popularity and the breed has recently moved into the ‘minority’ listing in the RBST watchlist. To support the Llanwenog breed, Sheepfold has purchased fleece from a local Cumbrian Llanwenog farmer and this will soon be available as scoured and carded fleece from our wool shop. Llanwenog wool is currently available in our Teddera, blended with wool from two other breeds. 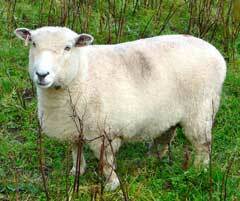 This small sheep originates from the Isle of Man; the breed is sadly now classified as ‘at risk’. The wool is chocolate brown; loaghtan is the manx word for the mouse brown colour. Spinners and weavers love this fleece, which weighs 1.5 to 2 kg, with a staple length of 8 to 13 cm. It is commonly used in the making of the Manx tartans. The sheep usually have two or four horns, with the rams horns being longer and stronger than those of the ewes. This wool is used in our Beckside cushion kit and Fan lace mittens kit. Manx Loaghtan wool can also be bought in 100g skeins and as scoured and carded fleece from Alice’s own sheep from our wool shop. This small primitive sheep originates from the tiny island of North Ronaldsay in the Orkneys, with wool in many shades of white, grey, brown and black. Nearly 200 years ago a wall was constructed on the island confining the sheep to the seashore. The sheep survived on a diet of seaweed, a characteristic they have retained. The North Ronaldsay sheep has been classified as an ‘vulnerable’ breed by the Rare Breeds Survival Trust, with fewer than 300 breeding ewes registered on mainland UK. These sheep also still roam on the island of their origin. North Ronaldsay wool, in a variety of natural colours, can be bought from Sheepfold’s wool shop as both DK weight and aran weight. The grey North Ronaldsay is used in our Fan Lace mittens kit. Occasionally this is also available as scoured and carded fleece from our wool shop. This small sheep was once common in Dorset, but is now very rare. Most adults have creamy white fleeces, but when the lambs are first born they are a beautiful foxy red colour. This colouring fades over subsequent months, although the adults retain tan colouring on their legs and face. Both rams and ewes are horned, with the horns on the rams being heavily spiralled. There is much debate as to whether the origins of this breed are from the 'primitive' or 'Mediterranean' groups of sheep. Tan-faced horned primitive sheep were found throughout the south west of England before the Roman Conquest. A further characteristic of more primitive sheep is that their lambs are born with their original colouring, as evident with the Portland. 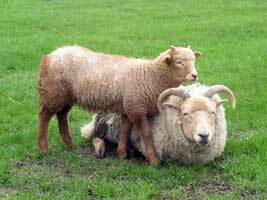 However, the sheep are long-tailed and can breed out of season, both being features of Mediterranean breeds. Cross-breeding of indigenous stock with sheep brought over during the Roman Conquest probably led to the inclusion of the Mediterranean characteristics in this breed. 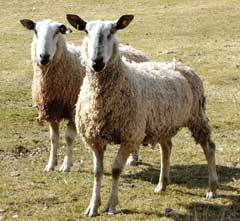 The Portland breed is now classified as 'at risk' by the Rare Breeds Survival Trust, but this is a huge improvement as there were only 86 breeding ewes in the UK back in 1974. Portland wool is currently available in our Teddera, blended with wool from two other breeds. The large Romney sheep have been seen on the Romney Marsh in South East England since the 13th century or before. This longwool is white in colour with a staple length shorter than the Wensleydale or Leicester Longwool breeds. Despite this, fleeces can weigh up to 10 kg. These fleeces are particularly popular for hand spinning or feltmaking. Ryeland sheep are amongst the oldest of the established British sheep breeds — developed by monks at Leominster in the rye growing district of Herefordshire during the 15th century. The breed is highly prized for its fleece, possibly helped by the supposed fact that Queen Elizabeth I was a strong supporter of Ryeland wool. It is also believed that the Lord Chancellor’s seat in the House of Lords, the “Wool Sack”, was originally stuffed with Ryeland fleeces. 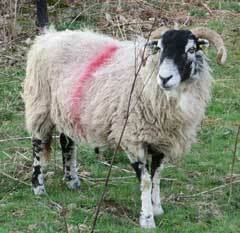 Although usually white, there is now a distinct ‘Coloured’ Ryeland sheep. In 2010 the Ryeland Flock Book Society gave the Coloured Ryeland equal status with the Ryeland. The fleece can be any natural colour or combination of colours. These hornless sheep are docile and produce a lovely fine fleece. Their appearance, with fleece on their faces, makes them compared to teddy bears! Fleeces typically weigh 2 to 3 kg with a staple length of 8 to 10 cm. Wool from Coloured Ryeland sheep is available as scoured and carded fleece from our wool shop, in two shades — ‘mid’ and ‘dark’. This is the smallest of the primitive British sheep breed and is thought to originate from Scandinavia. Their fleece comes in 11 different shades including greys, browns and oatmeal; the sheep also have distinctive markings with 30 of these being recognised. Shetland rams also have attractive rounded horns. Wool from Shetland sheep is renowned for its fineness and softness, being the finest of all the British breeds and so popular in knitwear worldwide. These small sheep produce fleeces weighing 1–1.5kg. In the 1970s this sheep breed was classified as ‘endangered’ by the Rare Breeds Survival Trust, but numbers have risen so well that they are no longer an ‘at risk’ breed. 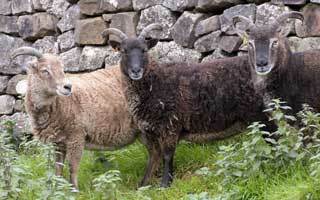 However, pure Shetland wool is still a rarity due to the small size of the sheep and inevitably low weight of fleece. Most is used by the inhabitants of the Shetland Islands in knitwear and tweeds. Shetland wool is currently unavailable from this website. 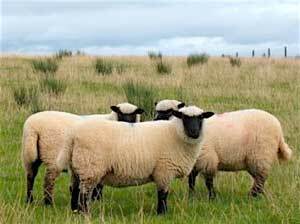 The exact origins of today’s Shropshire sheep are unclear but generally agreed to result from the improvement of the indigenous sheep of the Staffordshire and Shropshire border areas. 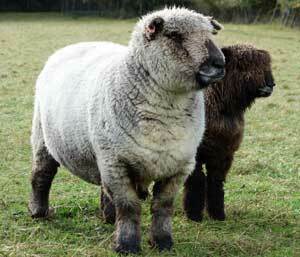 The Shropshire is a medium sized sheep with a clean black face and heavy dense fleece. This is another hornless sheep. Fleece weight is 2 to 3 kg, with a staple length of 10 to 15 cm, and virtually free from kemp and grey or black fibres. Apparently there is considerable demand for Shropshire wool in Japan, for filling Futons! In 2013 the RBST stated that the breed had experienced a "resurgence in its fortunes" and the breed was moved from its watchlist for rare breeds. Shropshire wool is available as scoured and carded fleece from our wool shop. The origins of this small primitive breed of sheep are uncertain. They originate from the small island of Soay which is part of the St Kilda archipelago, some 50 miles from mainland Scotland. Until the early 1930s pure-bred Soays could be found only on this island when the entire flock of 107 sheep was then transferred to the larger island of Hirta. The Soay breed has been classified as ‘at risk’ by the Rare Breeds Survival Trust. The fleece is usually brown with lighter markings. As with Boreray, instead of shearing, fleece is collected by ‘rueing’ (plucking). Ewes may then shed their fleece once they have been in lamb. These sheep are very feisty characters; we have even heard of one small flock successfully climbing apple trees to reach the ripe fruit! Having once been mostly limited to Swaledale in North Yorkshire, this mountain sheep is now also found commonly in the Pennines, being well suited to life on high lying moorland. 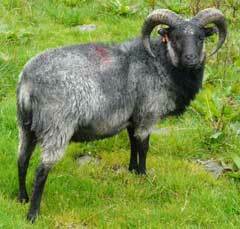 It has a black face with grey muzzle and both ewes and rams have horns. The long, white fleece is coarse and hairy making it suitable for carpets, though some of the finer quality fibre is used for tweeds and rugs and knitting yarn. The fleece weighs 1.5-3kg. This wool is used in our Zipped Purse kit. Teeswater is another longwool breed and is native to the Teesdale area in County Durham. The fleece is white and the breed has striking dark markings around the nose and ears. Teeswater rams are commonly used sire the Masham by crossing with a north country hill ewe, such as Swaledale or Rough Fell. 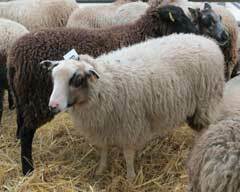 Despite the popularity of its high lustre fleece, the Teeswater has been classified as ‘at risk’ by the Rare Breeds Survival Trust. Teeswater wool is currently available in our Teddera, blended with wool from two other breeds. These large hornless sheep also have long white wool with a high lustre, and are classified as ‘at risk’ by the Rare Breeds Survival Trust. They are mostly found on the hills in the north of England and produce fleeces weighing up to 7kg. This wonderful fleece is used for knitting and upholstery fabrics and has a lovely knobbly texture when felted. Black Wensleydale locks can be bought from Sheepfold’s wool shop. The Whitefaced Woodland sheep originate from the South Pennines and are still found in the Peak District. They are also known as Penistone sheep, after the market town just north of Sheffield, where sales of these sheep have taken place since 1699. These are just some of the largest hill sheep, thriving in lowland areas, and have a white fleece which dyes well. Both sexes are horned with the rams' horns spiralling decoratively outwards. 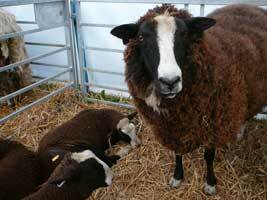 The Whitefaced Woodland sheep has been classified as a ‘vulnerable’ breed by the Rare Breeds Survival Trust. This wool is currently unavailable. 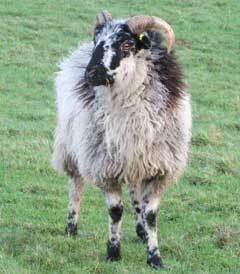 Zwartbles sheep originate from the Freisland region of Holland. With the number of Zwartbles in Holland becoming severely reduced, the breed was adopted by the Dutch Rare Breed Survival trust in the mid-1970s. In the 1980s Zwartbles started to be imported to the UK and have become increasingly popular over here being well able to cope with the lowland and mid-altitude conditions in England, Wales and Scotland. These tall and handsome black sheep have a striking white blaze; also white tips to their tails and two to four white socks. They have erect ears and are hornless. The thick, fine, naturally black fleece has a wonderful crimp and is ideal for spinning and knitting. 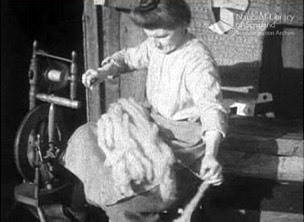 A 10 minute film produced in 1932 showing Shetland crofters gathering and then "rooing" sheep, and carding and spinning the wool to make jumpers. Image reproduced with permission of the Scottish Screen Archive, National Library of Scotland. Information comes from the relevant sheep breeders' societies and from British Sheep and Wool, published by the British Wool Marketing Board, and British Sheep, published by the National Sheep Association. You can find information about other British breeds in these two publications. RBST classifications are taken from their 2016 Watchlist.